I was really impressed by the 'wild-horse' single wing formation created by head coach Josh McDaniels and staff of the Denver Broncos while watching them beat the New England Patriots yesterday. 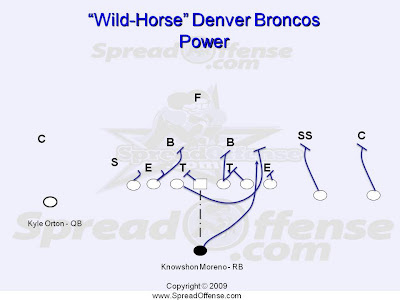 What was most unique about it was it resembled the 'wildcat' that is spreading in the NFL, but was more of a balanced set (as seen below), and it allowed for the quarterback, in this case Kyle Orton to shift back under center once the defense showed its hand on how it would defend the single wing with Knowshon Moreno at the Superback (or single wing QB). Here's a look at the basic 'power' out of the Wild Horse that we've learned to love out of the Wild Cat or any other single wing type set across football the last few years. I really like the double tight end set out of the single wing, it creates some serious gap issues, not that the single wing doesn't do that already with the '11th gap' it creates, but double tights really amplifies the effect. 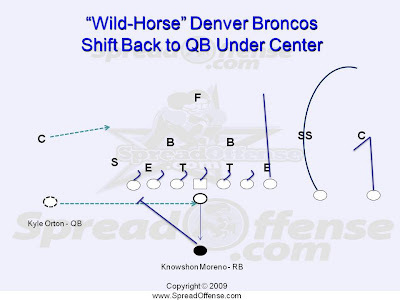 Here you'll see that Kyle Orton shifted back to an under the center QB set from the flanker (FL) position once the defense showed its hand versus the single wing wild-horse with Moreno staying put in the one back set. This play above shows Orton and the Denver offense executing a pass play after the shift back into a more traditional set. Even Phil Simms who was calling the play-by-play was very impressed with this 'shift' back wrinkle by the Broncos out of the Wild Horse as every play after them shifting produced positive yards with the defense being somewhat out of position. What Would We Do Without The Spread Offense?